"Marta is a dedicated, enthusiastic and patient teacher. The classes are fun and the steps are easy to get. I'm hooked on bellydance and can't wait for the next term to start"
Really loving that sword class Marta its fantastic! My arms are sore today and my leg muscles from tensing Haha. Good stuff! I first met Marta Hackett in 2014 and have become acquainted with her as a performer, instructor and as a model. As a performer of belly dance, she has the ability to engage with the audience, displaying innovation as well as technical expertise. Her costumes and make up are a spectacle themselves, but her dance is always paramount, executed with grace and skill. As an instructor, she was always well organised and was quick to assess the level of competence of her students. Her manner was quiet and friendly, encouraging confidence in the participants. As a novice with no particular skill or experience in dance, I found the sessions both pleasant and instructive. Marta has modelled in costume for a drawing group in Maryborough. She was punctual and agreeable to suggestions for poses. Her exotic appearance was stimulating to those drawing – the participants regarded the session as a real treat! She was confident and relaxed in a room full of strangers who were looking at her intently, and her physical fitness and body awareness enabled her to create and hold poses for up to twenty minutes. As an artist herself, she was interested in the outcomes and interacted well with the participants who were eager to have her return for other drawing sessions. I am confident to recommend Marta to other groups who would wish to engage her as performer, instructor or model. "Marta is a immensely sweet person with big desire to dance. Her age gives her enthusiasm and energy at her dance. It was a pleasure to play with her during my stay in Western Australia. She also helped me a lot to connect with people in Western Australia. Definitely, you will enjoy her classes and dance with her passion and positive energy." ​ I've won 2 free private courses before. This is an awesome experience to dance with Marta. If you are looking for a nice professional bellydance tutor in northern of River. I highly recommend Marta is the best choice. Best quality instruction I have ever had and lots fun. 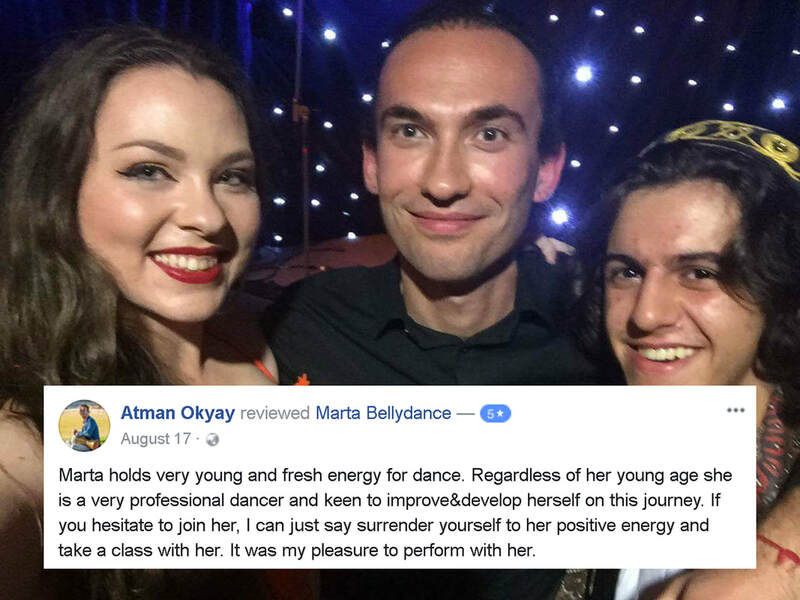 Marta is a beautiful and caring belly dance teacher. She even took the time to answer my questions and showed me moves on line after the workshop. Wish she had a class in Hervey Bay! Marta's workshop in Maryborough is amazing! She is a professional and passionate teacher. She is very caring about students needs and learning. Her class is full of fun, energy and her spirit. I would recommend more of my friends to join her workshop when she is back in Queensland, Maryborough again. Tell us your personal experience from your time in Marta's classes. E.g. What did you receive from the class? What was your favourite aspect of the class? Is there something you would like to suggest to Marta?